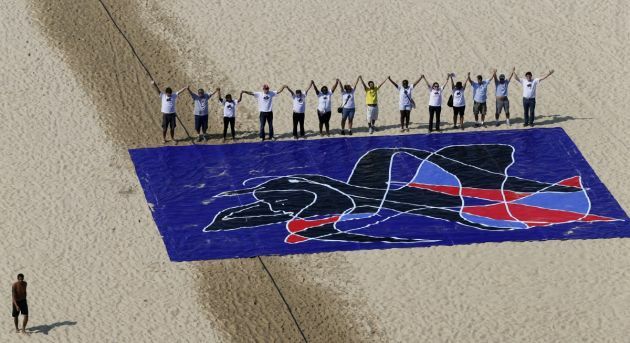 (Photo: REUTERS / Sergio Moraes)People from the Baha'i religious community pose for a picture next to a giant painting created by Brazilian artist Siron Franco, as part of the "Five Years Too Many" protest campaign marking the five-year anniversary of the imprisonment of seven Iranian Baha'i leaders, on Copacabana Beach in Rio de Janeiro May 5, 2013. The image represents that "Human beings should be free as birds," according to the artist. The Baha'i community in Brazil is protesting against the 2008 arrest of seven leaders of their religion in Iran for espionage, propaganda against the Islamic republic and the establishment of an illegal administration among other things, according to the organizers. Five members of the European Parliament have joined in a call for the immediate release of seven imprisoned former Iranian Baha'i leaders saying that it "unjust" and "unacceptable" religious persecution. The five MEP represent a wide range of political parties in the European parliament and joined a call made by Nasrin Sotoudeh, an Iranian human rights lawyer. The MEPs are: Cornelia Ernst who represents Germany's Die Linke party, Ana Gomes from Portugal's Socialist Party, Tunne Kelam a Christian Democrat from Estonia, Andrew Lewer, of the UK Conservative Party and Julie Ward of the UK Labour Party. They made video statements as part of a global campaign to call attention in May to the seventh anniversary of the arrest and imprisonment of the seven Baha'is, collectively known as the Yaran - the friends. "We join this appeal for their immediate, unconditional release," said . Kelam, "because no country can claim that it has normal conditions for its citizens when a part of their citizens - some minority - is being persecuted systemically and so cruelly." Gomes said: "It is really quite unacceptable that these Iranian citizens, who do not want more than to actually serve their country, their people, in service to the very peaceful teachings of the Baha'I faith, be in prison and be charged with accusations that are totally baseless." Briton Ward said that it is "very difficult to understand why the Iranian regime would be so aggressive and so cruel" towards its Baha'i citizens, who represent a faith of "peace, humanity, gender equality and fairness". Lewer also from the UK said Iran should be held accountable for its human rights violations generally, and particularly for its persecution of Baha'is. "With so much attention on Iran at the moment because of the nuclear talks," he said, "I think it is important that these issues are not overlooked. "Human rights and religious freedom should remain something that we stay concerned about even as we make progress, possibly, with Iran in other areas," said Lewer. Ernst said: "We are strictly against the fact that individuals such as the Baha'is are being imprisoned because they speak in favour of the right for education or because they support the right to practice their religion. "This is something that is absolutely unacceptable," she said. Rachel Bayani, representative of the Baha'i International Community's Regional Office to the European Union, said the videos reflect the sincere concerns of European Parliament over Iran's treatment of Baha'is. "These statements are a powerful expression of solidarity of the representatives of the people of Europe towards the people of Iran," said Bayani. Reported as one of the fastest growing religions across the globe, the Baha'i faith is a monotheistic religion underscoring the spiritual unity of mankind. It teaches that there is only one God and one human race. It has a religious background in Shi'a Islam. One of the youngest of the world's independent religions, the faith was founded by Bahá'u'lláh, a Persian nobleman from Tehran, in 19th century Persia. It claims more than five million followers across the world. In 2010, the seven, Fariba Kamalabadi, Jamaloddin Khanjani, Afif Naeimi, Saeid Rezaie, Mahvash Sabet, Behrouz Tavakkoli, and Vahid Tizfahm, were tried and convicted on charges of "espionage" and "spreading propaganda against the regime." They are wrong and false accusations said the Baha'i statement. They were sentenced to 20 years in prison, the longest term of any current prisoners of conscience in Iran.